← Should Christians celebrate Passover? Two years ago, I offered a terrific compilation of delicious Pesach recipes using matzah. 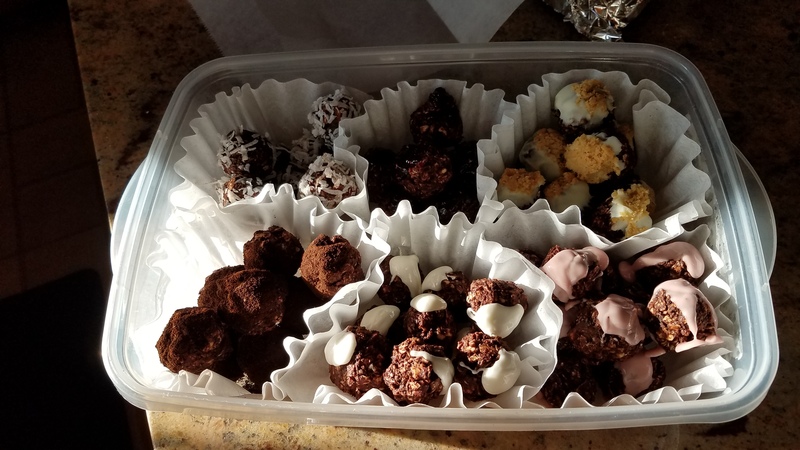 Well, the truffles have been so well received the last two years that I thought I’d kick the dark chocolate and sea salt truffles up a notch… Here is a selection of what I made late yesterday a I relaxed in the kitchen. Because we have been improving our diet and have been particularly intentional about adding coconut oil to our diet (google: health benefits of coconut oil!! ), I made a few little substitutions to the base recipe. Instead of 1/3 cup heavy whipping cream, I substituted 1/4 cup of coconut milk and a tablespoon of raw unrefined organic coconut oil. The above collection of truffles is the result of tripling the base recipe, then adding individual glazes or toppings to the truffles. Yield is about 50 truffles. The raspberry topping is simply a bit of raspberry jelly. Fireball whiskey, instead of Manischewitz for that glaze. Truffles were thoroughly chilled before dipping in luke warm white chocolate. Cappuccino and coconut were simply rolled in the respective coating while the truffles were a bit sticky before chilling. I used a bit more matzah than the recipe calls for to have a crunchier consistency. Cool chocolate to almost room temp before incorporating the matzah. This entry was posted in A Thought..., Holidays v. Feasts and tagged chocolate, coconut oil, cooking, dark chocolate sea salt, matzah truffle, Passover recipes, recipe. Bookmark the permalink.